In case you hadn’t noticed, the mass adoption of high-speed internet has dramatically transformed the way that businesses operate. For the first time in history, businesses are not impeded by geographical restrictions when it comes to securing a skilled, professional workforce. After many decades of an industrial, one-size-fits-all approach to business culture, flexible working arrangements are becoming more and more popular. According to a study by PGI, a software services provider, 80% of workers stated that working from home improved their morale, while 70% stated that working from home improved their productivity. It has been estimated that if an average American business allowed employees to work from home half of the time, they would save approximately $11,000 annually on overhead costs. While remote workers save money on commuting costs, it seems that money is not the key driving force for their choice of lifestyle. When 1,500 technology professionals were questioned, 36% stated they would take a 10% pay cut for the opportunity to work from home! One aspect of a business that is particularly well-suited for outsourcing to remote workers is content marketing. So long as the content is published on time, reflects the brand with integrity, and provides value to its intended audience, it makes very little difference whether the content architect is working from a bustling office under the prying eyes of his or her manager or alone on a tropical beach. The output is what matters to the customer, not the process. Additionally, many editors, copywriters, and visual content creators are natural introverts and choose to work remotely because they dislike the 9–5 schedule, dress codes, loud offices, hierarchies, and compulsory corporate team building events come with a traditional office job. In order to get the best results from these people, it’s important that they’re able to work in an environment where they feel comfortable and productive. By outsourcing your content marketing to remote workers, you can reduce costs and free your time to work on the aspects of your business which play to your strengths. Although outsourcing your content strategy can be daunting at first, follow these proven tips, and your chances of success will dramatically increase. Whether you find your writers on freelance sites such as Upwork and Freelancer or on job boards that pertain specifically to writers, such as Problogger or Freelance Writing Gigs, choosing the right worker can sometimes be challenging (for more about where to find writers, check out this post). First, it’s always wise to choose writers who are able to show positive testimonials from previous clients. You may get lucky picking someone green, but why take the chance if you don’t have to? Also, insist on seeing examples of their work to see if you like their style. While it can be useful if a writer has previous experience in your niche, if someone has experience writing about a range of topics and consistently turns out high quality content, this is a strong indicator they are willing to learn about your industry and brand in order to do a good job. Finally, include a special message in your job description for potential writers to repeat in their response—this shows that they pay attention to details which is a very important trait! Avoid writers who send generic responses which have absolutely nothing to do with the job description. This shows a lack of care which will probably be reflected in their work. While many business owners are fanatical proponents of face-to-face communication, giving instructions to remote workers is perfectly appropriate via email. In fact, having a written record of all discussions to refer back to usually helps to avoid ambiguity. That said, you do need to be crystal clear in the instructions you give to your writers in terms of tone of voice, style, formatting, and layout. It helps if you have a branding document or style guide to give to new writers, although there’s nothing better than an abundance of examples for writers to mimic. For this reason, you may wish to hire one writer initially before branching out to a team. In his highly actionable book Content Machine, author Dan Norris states that implementing a style guide led to a dramatic improvement in the standard of content submitted by external writers. 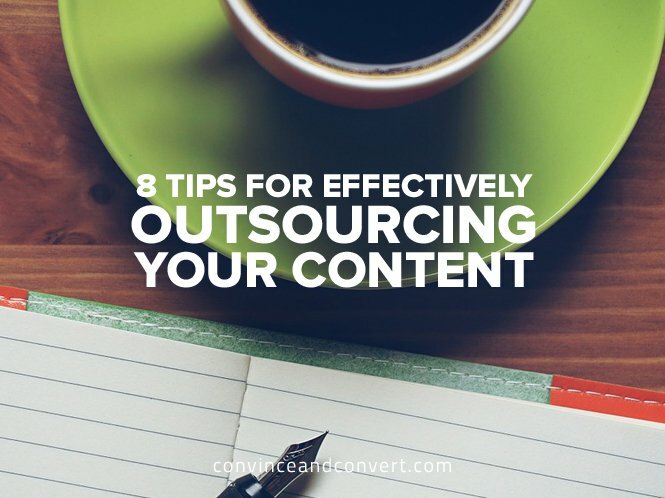 Outsourcing content is not an excuse to outsource your brainpower; it’s still up to you to come up with a long-term vision for your content strategy. Once your vision is clear, it will be a lot easier to set instructions for your writers, so that they can generate content which perfectly aligns with that vision. For this reason, you may wish to use an editorial calendar and schedule your content months in advance. If you want to boost your company’s visibility and reputation in 2016, it is essential to publish high quality articles on a regular basis. While it’s important to ensure your content adheres to your style guide to preserve the integrity of your brand, avoid agonizing over minor details if it creates a bottleneck in your publication schedule. Particularly for niches such as digital marketing where the value of a post is usually based on its utility, your audience cares more about receiving actionable information than they do about whether the author adheres to your in-house style guide. Your blog posts don’t need to be literary masterpieces—they just need to provide insane amounts of value to your audience (the people who keep your business afloat with their money). Edit every post to make it as impactful as possible, and always provide writers with clear feedback for how they can improve, but always prioritize consistency over perfection. Most people don’t have the talent or ability to become aeronautical engineers, brain surgeons, or UFC fighters, but writing is a skill that almost everyone has some level of proficiency at. Because freelance writing is available to anyone with an internet connection, supply far outweighs demand, which in turn drives down rates. You can offer writers $10 to write a blog post, and you’re likely to get many responses, but as the saying goes, “If you pay peanuts, then you get monkeys.” Your content is an extension of your brand, so pay to get high-skilled writers who will take the task seriously. If you do get lucky and find someone who is talented and prepared to work for a meager wage, they’re either just getting started and lack a portfolio or are going through a dry spell and will leave you as soon as a better job comes along. Either way, underpaying writers is not a smart (or ethical) strategy if you want to succeed at content marketing long-term. It’s far better to have two good blog posts a month than two underwhelming posts per week. While you and your remote workers may not enjoy beers after work or jovial conversations next to the office watercooler, it’s important to remember that they are still real people. Positive feedback and praise (when deserved) is always well-received. People want to work for those that appreciate their efforts, regardless of whether the relationship is face-to-face or remote. Similarly, if a remote worker has encountered a person problem that will affect their output, try to be compassionate. By investing in long-term relationships with your workers (rather than seeing them as expendable labor), you’ll create a profitable partnership for both you and your workers, economically and emotionally. Some types of visual content don’t require outsourcing—with tools such as Canva, you can create compelling images to accompany your blog posts and share on social media. However, for more complex forms of visual content such as infographics, the DIY approach is not always ideal (unless you are a designer). Many diabolically bad infographics are the result of the following scenario: a business leader, who knows nothing about infographics, commissions a content writer, who knows nothing about design, to write content for a freelance designer, who is working on 10 other projects at the same time. A disjointed production process normally results in a disjointed infographic. It’s always best to hire a researcher/copywriter who has proven experience in creating content within a visual context (a background in design is desirable), and it’s even better if they already have a working relationship with the designer you’re using. While great illustration-oriented infographics can be produced by employing a remote writer and designer separately, for more sophisticated infographics with lots of data points, graphs, and charts, team chemistry and experience is very important. As with blog posts, infographics are an extension of your brand, so unless you are convinced you can do them properly, it may be better to steer clear. An unprofessional, poorly designed infographic sub-communicates that you do not take your business seriously. While many businesses want their writers to anonymously ghostwrite for their brand, there are some big advantages to giving them byline credits. Firstly, writers tend to produce their best work if their name and headshot is featured alongside the content. Every good writer has some degree of ego based on their skills, so use this to your advantage! Secondly, if the writer has a popular blog or a strong digital presence, you can encourage them to share the content with their networks, sending more traffic to your website and boosting your brand reputation as a consequence. The popular personal development and productivity-boosting site, Lifehack, is an excellent example of this. Just because a piece of content adheres to your style guide and makes you gleeful doesn’t mean it will gain traction and help to build your business in the long-term. Social media shares, the quality/number of comments left on blog posts, website traffic, content-related conversions, and email newsletter subscriptions are all indicators of how effective your content is. Although it’s difficult to judge a piece of content in isolation (sometimes the least expected pieces gain the most engagement), you can see trends appear over time. If in doubt, ask your audience what kind of content they like. Add a survey to your website or send an email to your subscribers. If you don’t truly understand your audience, it’s difficult to craft content that they will enjoy, so make this a priority. This point is particularly crucial in the context of outsourcing, as it can be easy to blame remote writers for creating underwhelming content when you haven’t taken the time to learn about your audience’s desires, dreams, and aspirations, and therefore have no idea how to generate engagement. Rob Rawson is a co-founder of Time Doctor.